Not everyone with a brain tumour will experience memory difficulties, and for those that do, the symptoms and severity will differ. Learn more about how brain tumours can affect memory and read top tips to help cope with memory loss. Memory is our ability to take in and store information, as well as to recall that information at a later time. Memory is one of our cognitive (thinking) functions. This is when we remember things from a few seconds ago, such as the name of a person we just met. Short-term memory lasts for approximately 20 seconds. A short-term memory can be forgotten after those few seconds or can be converted into long-term memory, depending on its importance and the circumstances. Part of short-term memory is your working memory. You use this to store information on a temporary, short-term basis, such as when you need to remember numbers to do a sum in your head. This allows us to recall information from the past, whether it's a minute ago, a year ago or many decades ago. Procedural memory - Remembering how to carry out processes and activities, such as swimming, driving and riding a bike. Semantic memory - Being able to describe and give meaning to our world. This involves the language we use and all the concepts associated with it, for example, naming a city or describing what a cat is. Episodic memory - Remembering specific events and experiences you have lived through, such as what happened at a relative's birthday. Prospective memory - Remembering appointments or events that will happen in the future. How can my brain tumour affect my memory? getting the information back out again when you need it (retrieving or recalling). Brain tumours could cause difficulties with one or more of these stages. The severity and type of memory difficulties differ from person to person, so you may not have the same problems as someone with a tumour in the same location and having the same treatment. Many areas of the brain are involved in storing and recalling different types of memories. For this reason, it's not always possible to accurately predict if and how a person's memory will be affected by a brain tumour. However, two areas of the brain are particularly involved in memory – the frontal lobe and the temporal lobe. 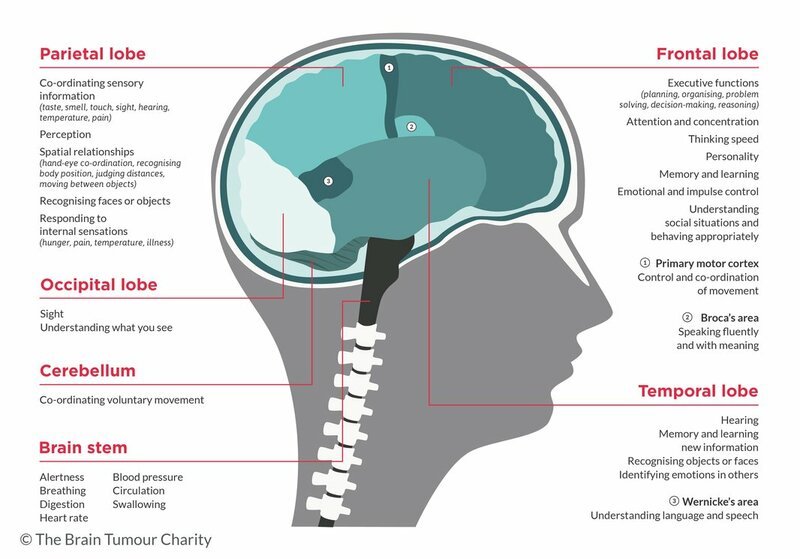 If your tumour is in these areas of the brain, it's more likely (but not definite) that your memory will be affected. Neurosurgery, chemotherapy and radiotherapy can all have an effect on the brain that may, in turn, affect memory. Again, the effects of treatment will vary from person to person. Surgery on the brain can cause some temporary swelling, which may affect cognition in general, including your memory. Chemotherapy and radiotherapy may also affect cognition and energy levels in general. Side-effects caused by these treatments could last for weeks, sometimes even months, after treatment has ended. What sort of memory difficulties might I experience? Loss of memories formed before you had a brain tumour or treatment (retrograde amnesia). Difficulty remembering memories formed after you had a brain tumour or treatment (anterograde amnesia). Identifying exactly what kind of memory difficulties you have, can help you and your health team work out ways to reduce the effect these problems have on your everyday life. Don't be too hard on yourself. Not being able to remember things like you used to can be frustrating, stressful, embarrassing, and more. People with memory difficulties have said it helps if you can be upfront and open about it (tell people you have difficulties) and also, where possible, see the funny side of it. Plan ahead - Mentally go through what you will be doing and what you are likely to need, write it down, then put everything you need somewhere that you can't miss it, like by the front door. Make lists - Keep a shopping list on a notebook in the kitchen or on your phone, some supermarkets have apps which have a shopping list function. Add items when you run out and tick them off when you go shopping. You could also consider online shopping - supermarkets produce a list of your favourites and recently bought items to prompt you. Develop a set routine - Having a regular routine can help you to remember what is going to happen throughout the day. Make sure you include time to rest and plan some variety, so you don't get bored. Have particular places to keep things - leave items in the same places around your home, so that you know where to look for them. For example, if you have difficulty finding your house keys, try to always leave them in the same drawer. Or have a large bowl, near the front door, where you leave all the important things you need to take when you leave the house – keys, purse/wallet, phone, glasses etc. Label drawers and cupboards - get rid of unnecessary items and label drawers and cupboards with what is inside them – using words or pictures, whichever you find most useful. Colour code your keys - you can get coloured 'covers' for your keys. Use a different colour for each key and keep a list in your purse/wallet and on a noticeboard in your kitchen of what each coloured key is for. Leave yourself reminder notes - this can help you with things you might otherwise forget. For example, you could leave yourself a note by the front door reminding you to check that windows are closed before you leave the house. Reduce noise and minimise distractions - it's more difficult to remember or learn new things when your environment is noisy or busy. Mobile phones - your mobile phone can be used in many ways to help with memory. You can use the calendar and alarm to remind you about events and appointments. Take photos of what you are doing in the day to look back on or add photos to your contacts to help you remember people. Use websites, such as Googlemaps, if you are getting lost in familiar places. You can add "in case of emergency" or "ICE" after a contact, so that someone can find an important contact, even if you can't. Apps and memory games - you can download apps for relaxation exercises and other techniques that can help reduce stress, and so help with memory. There are many apps and online games that claim to test, train and improve your memory. However, there is no real evidence that playing memory games improves memory. You may get better at the game, but this does not mean the benefits last or transfer over to real life. There is some evidence that keeping your brain active may help to slow down deterioration of your memory, but there are many ways of doing this. So the games may help with this, but it is the mental activity rather than the games themselves, that is having the effect. Keep a diary - if you prefer written reminders, a diary is a good way to keep track of your plans. Medication organisers or pill boxes - if you are taking prescription medications, you may wish to buy a medication organiser or pill box to help you track what you have to take and when. These are available from most pharmacies. Keep things relatively simple - memory difficulties may affect your ability to undertake complex activities. Avoid multi-tasking - focus on one thing at a time and break down tasks into small steps. Create breaks between tasks, such as making a cup of tea or even just stand and stretch. To remember a name - when you are first told the name, concentrate and make sure you have heard the name correctly. Connect the name with something about their physical appearance, the type of clothes they wear, or their personality. Use their name in conversation and also repeat it in your head. Afterwards picture the association you have made between their name and appearance. When you meet them again, hopefully seeing them will jog your memory into remembering the association you previously made and, therefore, their name. Words starting with the same letter as the person's name or which rhyme with their name can also help. For example, Happy Hannah or, for a keen cyclist, Bike Mike. As an alternative, you could carry a small photo album with people's names by their pictures. Or save photos, with contacts on your phone. To remember a word - try not to worry about finding the exact word and use a different word instead. Or you could describe the word. Don't let this put you off socialising – tell your friends about your difficulty finding words and let them know how you want them to help e.g. do you want them to prompt you? To remember where you put something - try to picture yourself and where you were when you last used it. Or picture what you were doing when you last had it. To remember why you have gone into a room - many people find that they go into a room and can't remember why. Go back to where you were when you decided to go into the room and retrace your steps. It often helps to jog your memory. To remember what you have done during the day - Talk about your day to others or yourself; write it down and look back over it. Some people use their mobile phones to take photos throughout the day to remind them. Rehearse - Once you have found the strategies and techniques which work for you, practice them with a friend or partner. Exercise - exercise has been shown to help memory and thinking by affecting chemicals and blood flow in the brain, and by improving mood and sleep, and reducing stress and anxiety. Try to exercise for at least 30 minutes, five times a week - anything that gets the heart pumping or makes you break out in a slight sweat. You can try brisk walks, swimming, cycling, dancing or tai chi, even doing the housework or the gardening! Diet - eat regular, balanced meals, and try to include your 5-a-day of fruit and vegetables. Taking time to eat your meals can also help give regular breaks in the day and time to recover mentally. Try to drink at least 2 litres of fluid a day, and drink alcohol in moderation. If possible, give up smoking. Read more about diet. Rest and sleep - Take plenty of breaks and rest throughout the day or even whilst doing tasks. People with brain tumours often feel fatigued for a variety of reasons and being tired can affect your ability to memorise or remember things. Likewise, get a good amount of sleep (6-8 hours) to help with this. Keep you brain active - Keeping your brain active may help you keep your memory skills for longer. There are many ways to do this including reading, watching or listening to the news, doing puzzles/jigsaws or games, learning a new hobby. Try to do a variety of things so all your senses are used. Stay socially active - Research has shown that staying socially active is one of the best ways to help maintain your memory skills. It can be difficult, as you may have lost confidence, but having good friends, volunteering for charities and other forms of social engagement seem to protect memory. Read our tips on taking care of your mental health and overcoming isolation. Listening to relaxing music or sounds, such as waves. From friends and family - Talk to them about the memory difficulties you have, how it makes you feel and how they can help. They can help you practise memory techniques, or prompt you about the technique, if you are having problems remembering something. From healthcare professionals - Speak to your healthcare team. They may be able to refer you to a neuropsychologist or clinical psychologist, who can run various tests to see exactly how your memory is affected and help work out ways to reduce the effect on your everyday life. From our Information and Support Line - 0808 800 0004 or support@thebraintumourcharity.org We are here to help in any way we can. Find more information on memory difficulties in our full fact sheet. Find more information on memory difficulties in our clear print fact sheet. Jennifer's shares her experience of memory difficulties after being diagnosed with a brain tumour.